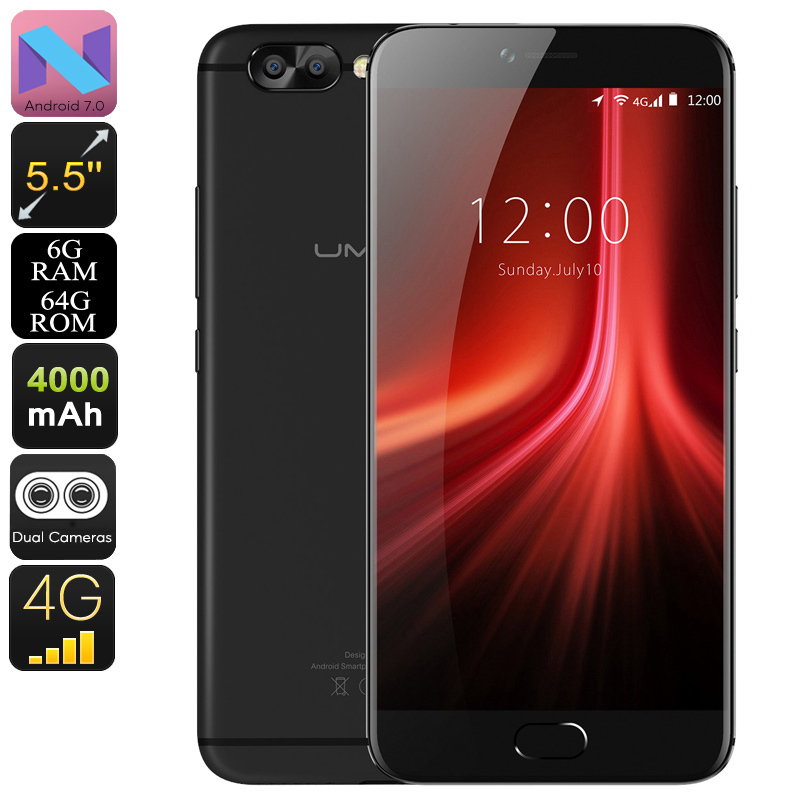 Successfully Added UMIDIGI Z1 Pro Android Phone - Helio P20 CPU, 6GB RAM, Android 7.0, 1080p, 4000mAh, Dual-Rear Cam (Black) to your Shopping Cart. If you are looking for an affordable Android phone that comes packed with remarkable hardware, the UMIDIGI Z1 Pro is a perfect choice. This sleek smartphone is world’s thinnest big battery phone. Its 4000mAh cell provides you with up to 20 hours of continuous usage time. Thanks to this, you’ll be able to enjoy all the Android phone has to offer for multiple days without needing to recharge. But this is not all, besides its whopping battery, the UMIDIGI Z1 Pro also packs state of the art hardware that brings forth a remarkably powerful performance. No matter what you throw at it, this latest Android phone will handle it all. The MediaTek Helio P20 processor is in place to provide you with all the power needed to tackle the latest software. This chipset has been clocked at 2.3Ghz thanks to which it’s able to deal with the most demanding applications out there. Along with the phone’s 6GB RAM, you’ll be ale to engage in multitasking sessions without ever slowing down your device. Whether you like to play games, browse the web, or watch movies – this latest Android phone handles it all. It has 64GB of internal storage and a 256GB SD card slot. Thanks to this, you’ll never run out of space to store your latest acquired files and media. With its 5.5-Inch AMOLED display, this Android smartphone treats you on stunning visuals. All your favorite media can be enjoyed in breathtaking 1080p Full-HD resolution. This allows you to undergo a cinematic experience from the palm of your hand no matter where you’re at. The display has furthermore been crafted out of Corning Gorilla Glass 4. Thanks to this, you won’t have to worry about accidentally breaking of scratching it throughout the day. Simply open up your saved videos or stream them straight from the web. With Dual-IMEI numbers, 4G, and Dual-Band WiFi you’ll always have access to the fastest internet speeds out there. At the rear of this sleek Android phone, you’ll find its stunning 13MP Dual-Rear camera. This piece of hardware comes with an abundance of features to lift your mobile photography to the next level. It is capable of shooting mesmerizing images at both day and night. Besides that, it allows you to shoot Ultra-HD 4K video of all your upcoming adventures. Additionally, this Android smartphone also has a 5MP front snapper. This little camera is great for taking selfies or for engaging in 1080p Full-HD video calls. The UMIDIGI Z1 Pro comes with a 12 months warranty, brought to you by the leader in electronic devices as well as wholesale electronic gadgets..